Bio+Active Flax-seed-germ capsules 100 pcs. OM Relax capsules 250 pcs. There isn't another one among the 3 million edible plants whose nutritional values could be compared to those of hempseed. Proteins present in hempseed contain all the 8 essential amino acids that are indispensable for life and are easily digestible at the same time. Hempseed is an ideal source of all the essential amino acids, e.g. omega-3 fatty acids or also called alfa-linolenic acid, plus omega-6 fatty acids, that is linoleic acid. Hempseed on the other hand contains significant quantities of gamma-linolenic acid (GLA), too, which has got a serious therapeutic power. 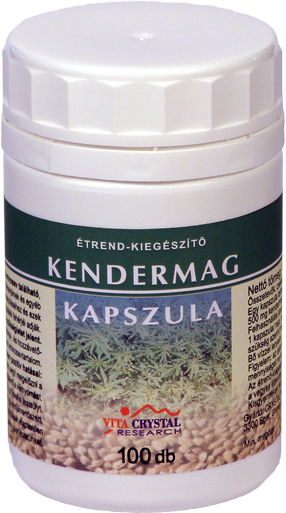 - Helps to prevent cardiovascular problems and lowers blood-pressure. - In case of obesity it helps to restore the ideal body-weight, empties superflual fat from the body. - It supports the immune system. - It stimulates cerebral functions (protein replacement in the brain). Its ordinary consumption basically helps the body to prevent or cure malignous alterations.